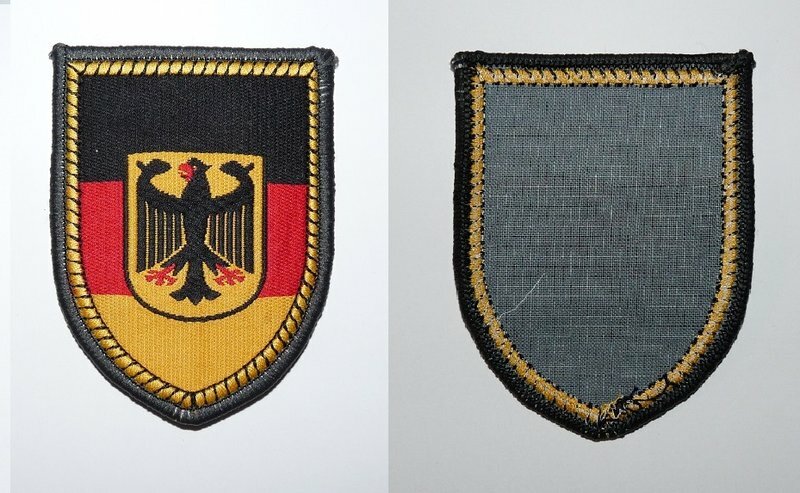 In 1962, 7 years after the formation of the new German armed forces (Bundeswehr), colored shoulder sleeve insignia were introduced for wear on army uniforms. 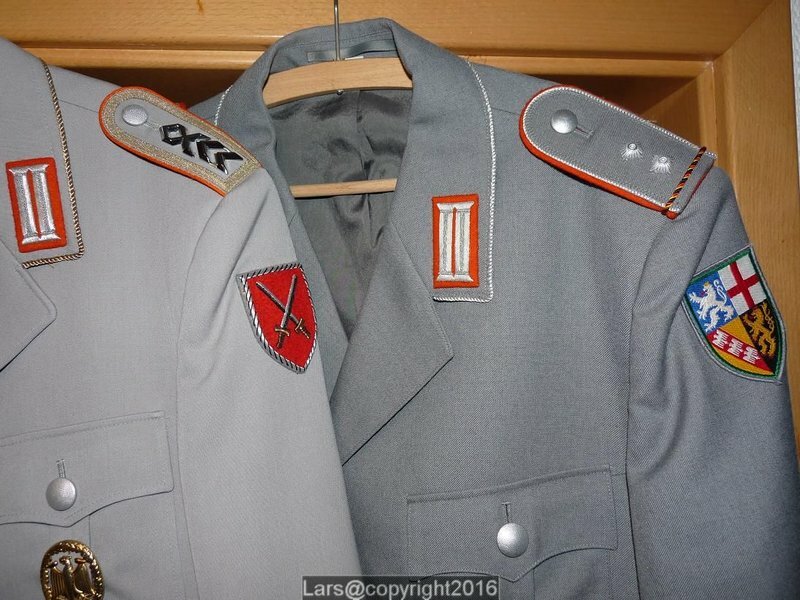 Obviously influenced by the U.S. Army patches these new "Verbandsabzeichen" were released for wear on the left shoulder of the grey army dress uniform (Dienstanzug). While colored and subdued shoulder sleeve insignia and pocket patches are worn on field uniforms of all military branches since the 1980's latest, the wear of SSI on dress uniforms is limited to army uniforms strictly. As mentioned before these SSI are worn on grey dress uniforms and the grey/blue coats (latest pattern with double button row). They are not worn on shirts, blouson, gala dress and grey/blue coats with covered button row. In general Verbandsabzeichen are made of woven cotton. These woven variants are officially issued and are worn by all ranks. Officers and NCOs can purchase hand embroidered (bullion) variants for their uniforms. 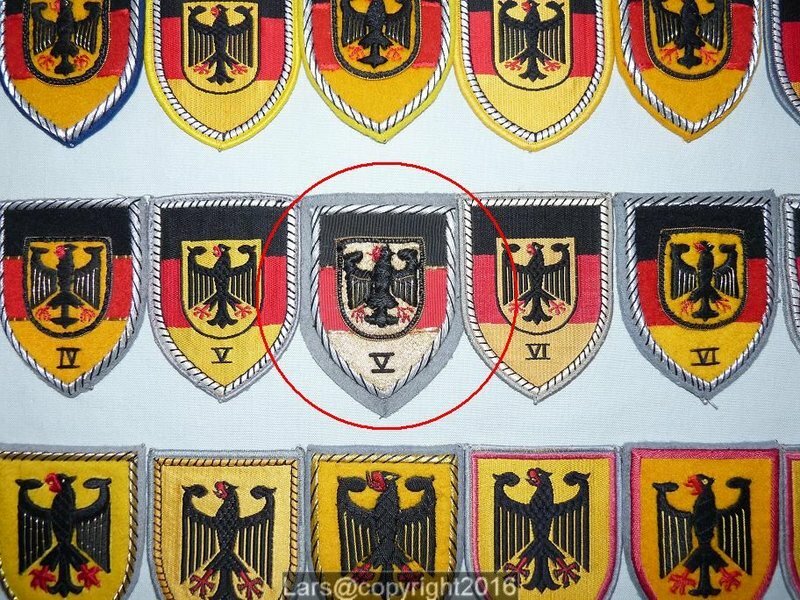 A third variant does exist as well: Machine embroidered SSI were made in small quantities since the early 1960's. They do not exist for all units but can be found occasionally. Hand and machine embroidered SSI can be found as "Lurex" variants as well. Lurex is a british brand name. In this case used by collectors for SSI with glittering golden or silver surface/heraldic elements. A total of 162 different Verbandsabzeichen was released since 1962. A large amount of manufacturer's errors and color variants exists as well but I'll focus on the standard SSI first and foremost. 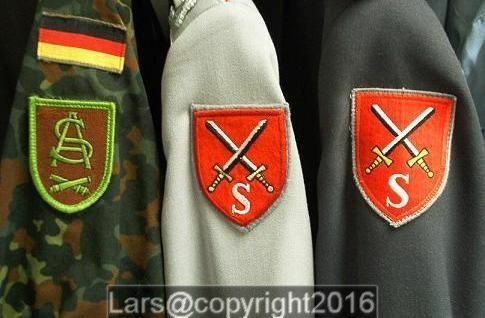 A woven SSI of Heimatschutzbrigade 54 on a officialy issued Oberleutnant der Reserve uniform in the background compared to a privat purchased Oberstabsfeldwebel uniform with hand embroidered SSI of "Amt für Heeresentwicklung". Thanks for putting together a thread on German SSI and on what uniforms they are worn on. What is Lurex , a type of woven cloth and why was it discontinued? thanks for your feedback and your question! I used a vague term in my first post but corrected it right now. 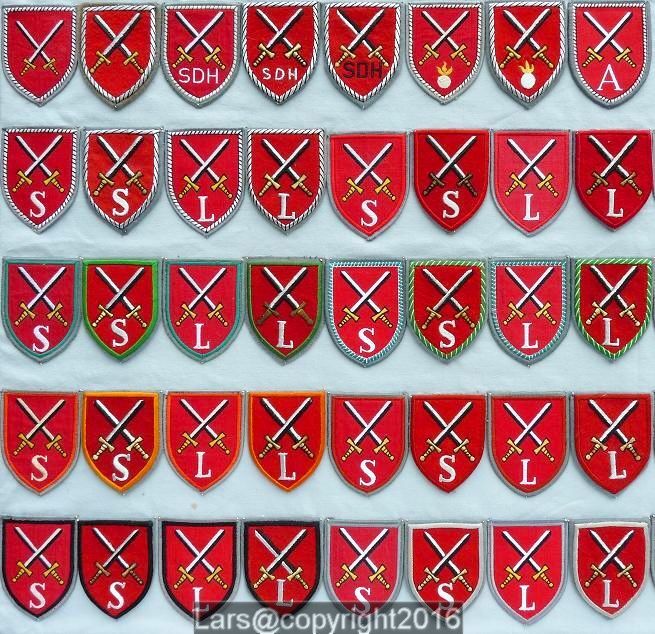 "Lurex" is the collector's term for SSI with golden or silver "glittering" surface or heraldic elements. These patches can be found still today. 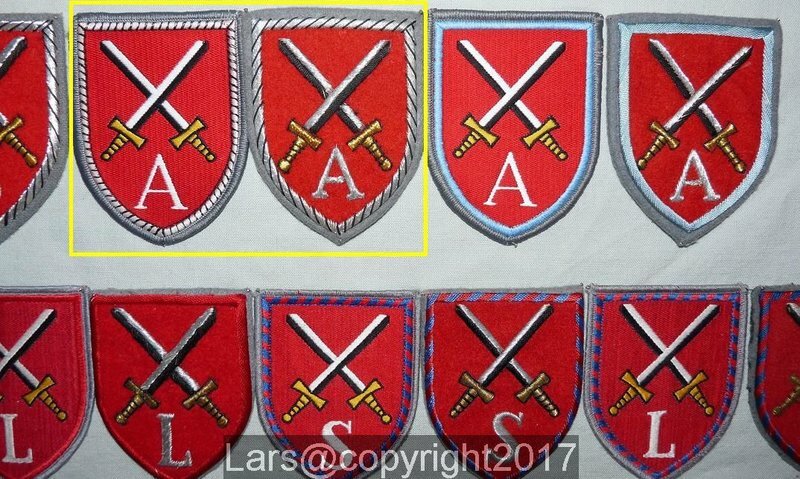 Machine embroidered insignia were discontinued for unknown reasons. 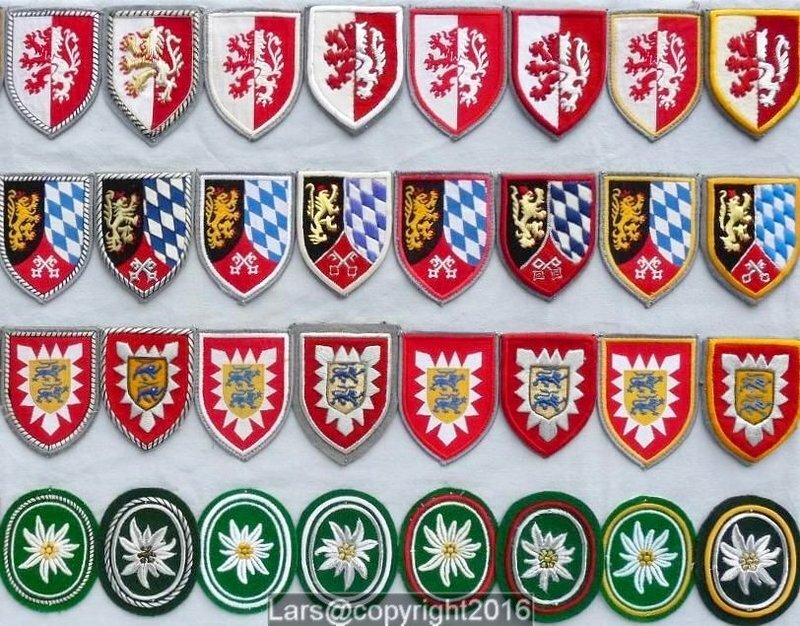 They are still produced/offered by some manufacturers but no longer for sale at the Kleiderkasse/LHBw. Verbandsabzeichen can be identified rather easily. The heraldic shield of the insignia of the Ministry of Defense and other higher commands is generally divided into 3 parts, the national colors black, red and gold (actually a metal). This shield is superimposed by another (golden) shield with federal eagle or other symbols e.g. the iron cross. Commands differ from each other by various border colors. The federal eagle is the highest heraldic element and reserved for higher commands down to Corps level. 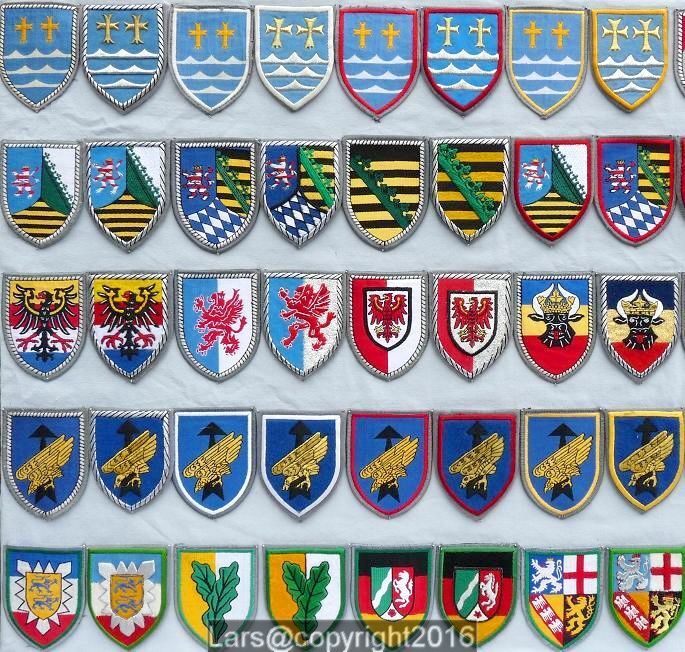 Please find attached another picture of my collection (displayed is always a pair of machine woven and hand embroidered SSI). 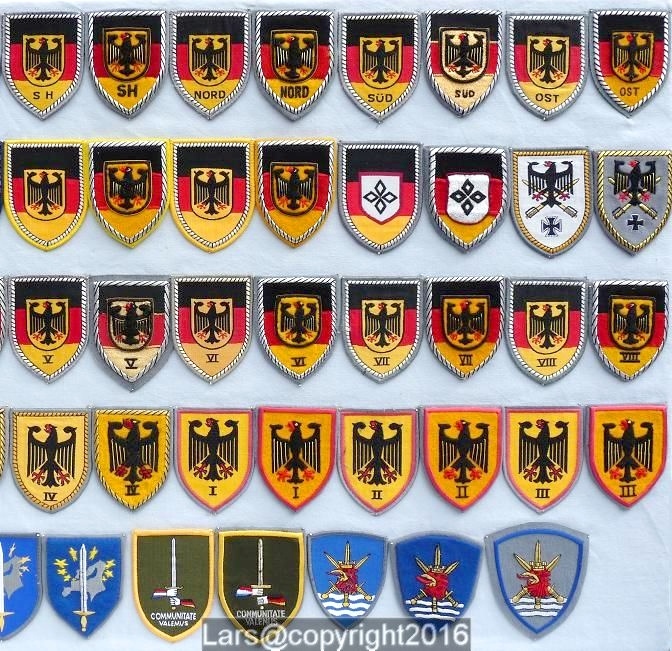 First and second row: Bundesministerium der Verteidigung (BMVg - Ministry of Defense) and various higher commands including: Territorialkommandos Schleswig-Holstein (SH), Nord, Süd, Ost. Fourth row: Heeresführungskommando, I., II., III., IV. Korps including Panzerregiment 100, 200, 300 (Corps insignia with pink border). 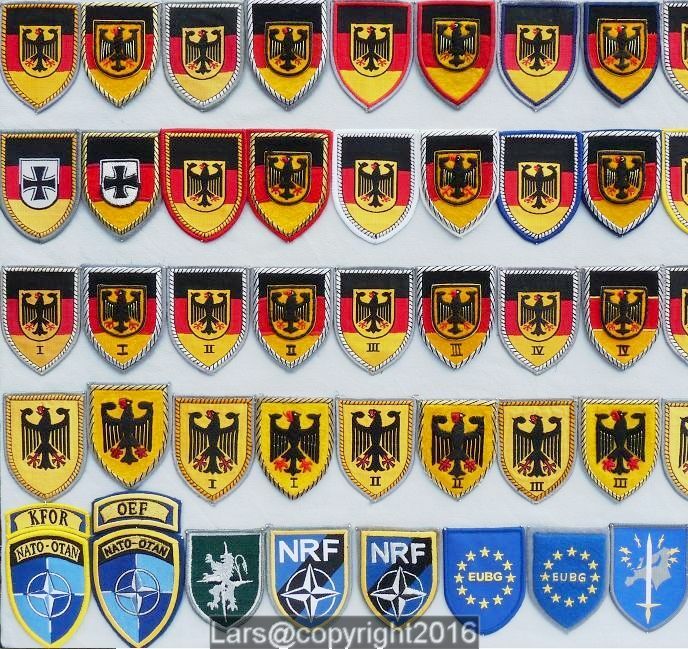 Fifth row: NATO, EU, Multi-national Commands. Referring to the existing SSI one could categorize the German army (Heer = ground forces) easily into two parts. First the higher commands like the army department and the army training command with subordinated schools, training centers and (former) training units. Secondly the field army with it's corps, divisions and brigades etc. Members of the first-mentioned commands, schools and training units wear a red shield with the symbol of the German ground forces, the crossed swords. School's and traning center's SSI show the letter "S" in addition and a colored border, in most cases the branch insignia's color. The school's training mission is supported be special training units "Lehrverbände". Depending on the branch and their mission the training unit's size varies from company to brigade level. These units wore the branch color bordered insignia of the school they supported with the letter "L" (Lehr- = training). Today all training units are under opcon of field army units so all of the "L" letter training unit patches are obsolete. 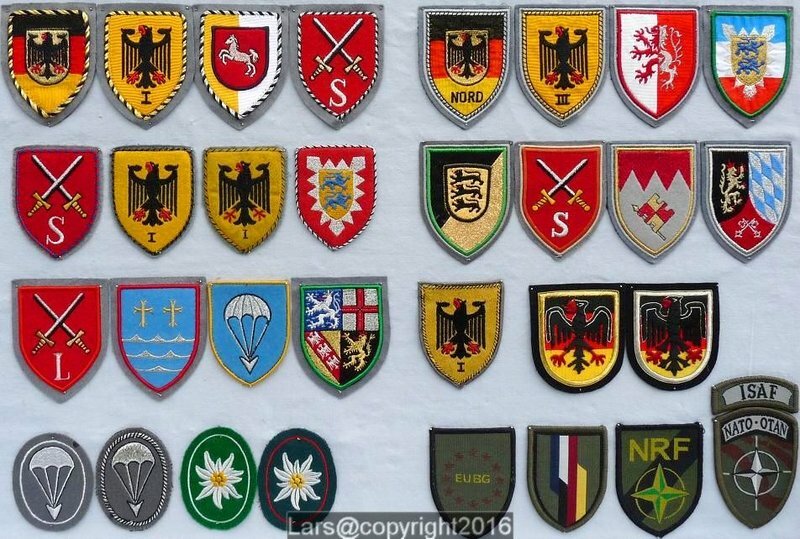 Until German unification the German Bundeswehr ground forces were structured into 3 army corps with 12 divisions and 36 combat brigades. 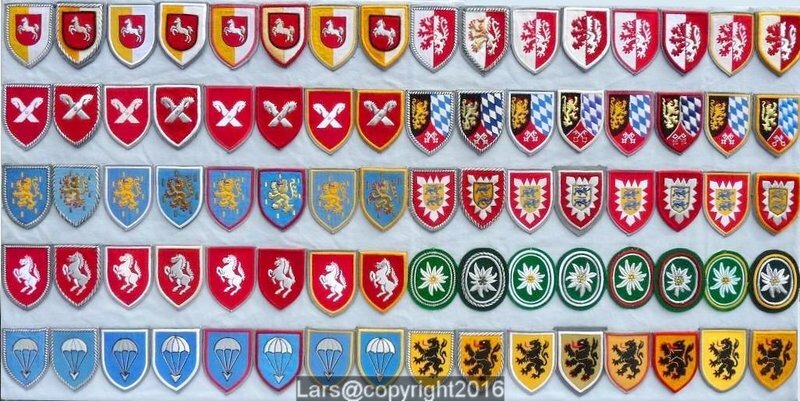 In most cases the army division's insignia consits of heraldic elements related to the mission (airborne, mountain) or the coat of arms of the state or region the division was deployed. Pictures of divisions 1-10 and their brigades 1-30. The close-ups. Machine woven patches on the left, hand embroidered variants on the right. Top row of the next picture: 11. Panzergrenadierdivision and 12. Panzerdivision with brigades 31 - 36. So far the Bw cold war structure. To make a long story short. 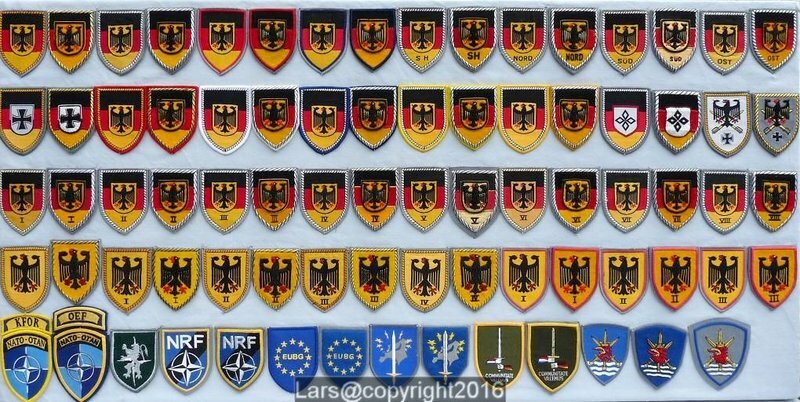 After German unification the East German NVA and most of the West German Bundeswehr units were disbanded. Two new Bw Divisions were deployed in Eastern Germany (13. & 14. Panzergrenadierdivision). 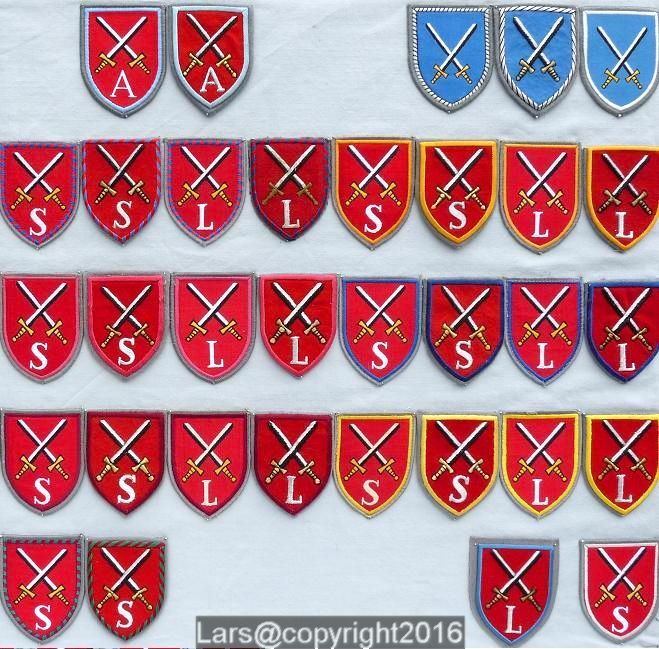 Their brigade's SSI differ from the division's insignia, each referring to the region they were deployed in (second and third row of the next picture). New divisions were deployed like the Division Schnelle Kräfte (rapid deployment division) and the Division Lufbewegliche Kräfte (air mobile division), their insignia depicted at the fourth row of the board. The former Heimatschutzbrigaden (home defence brigades, fifth row) were disbanded completely. In 2002 the Heerestruppenkommando was formed. This command consisted of separate combat support brigades (Artillery, NBC Protection, Logistics, Air Defence, Engineers) each wearing the command's patch with the branch-color border (first row of the next board). Most of these units were disbanded until 2011. The Sanitätsdienst der Bundeswehr became a separate military branch in 2000. 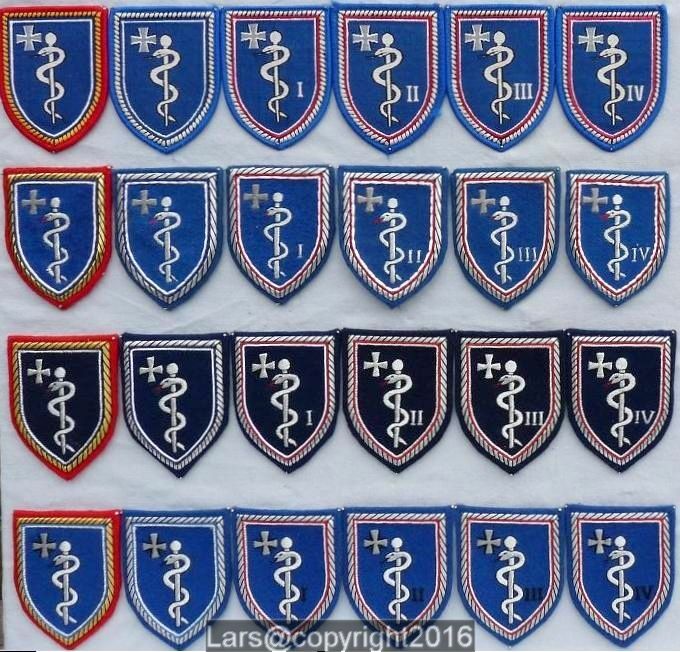 Since then members of the different medical commands wear their own SSI (depicted on the left side of the next board - official insignia on the top row, manufacturer errors/variants below). I'm still getting my head around the size and scope of the Bundeswehr Verbandsabzeichen. Why did they select the shield and not have individual design shapes for units? I do understand that the contents of the shield retains all the information , but espirit decor by having separate designs is frowned upon? I hope I understood your questions right. I'm unsure if the different designs of the SSI were even requested by the different divisions, which were formed only a few years before without any "historical lineage". 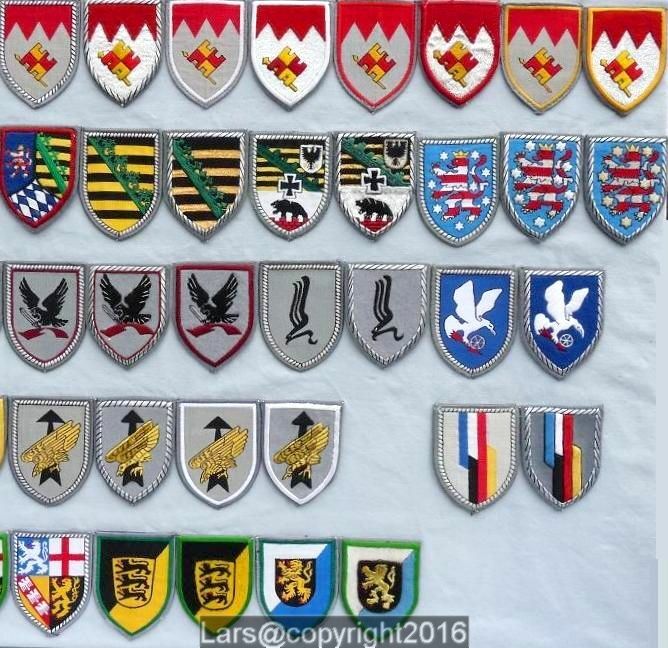 I assume that these insignia were developed en bloc at the ministry of defence under the application of more stringent heraldic rules. 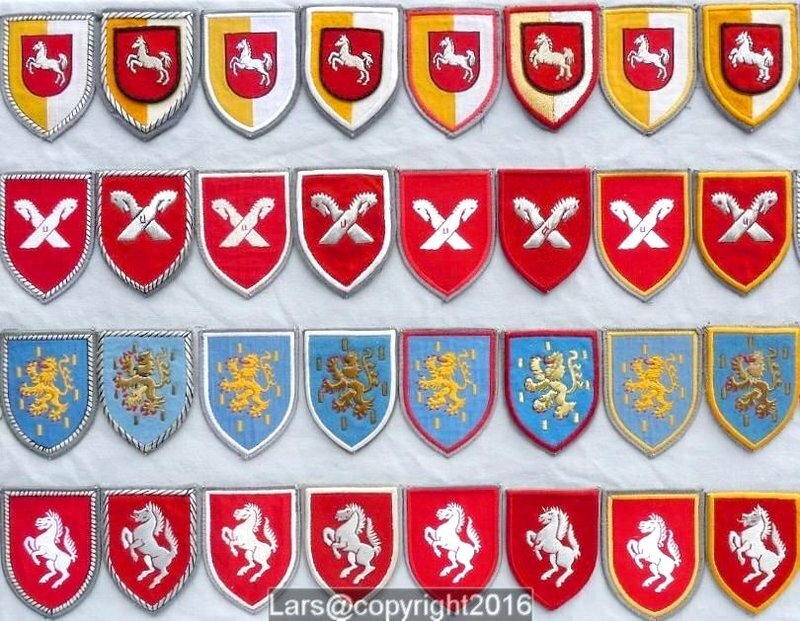 To gave them all an equal look the most popular heraldic base, the shield was chosen. You mentioned the esprit de corps. I think it rather exists on battalion or battery/company level than on division level. For this purpose "Interne Verbandsabzeichen" (pocket hangers similar to US Army DUI) were introduced in the early 1980's. The existence of several thousends of different pocket hangers proves this theory IMHO. I have enjoyed looking at your collection , mind blowing!! Update: the bullion variant of the Ausbildungskommando insignia, still missining on the initial schools/training unit board's pic. The patch was released in late 2016. Latest update. Now available is the new machine embroidered Verbandsabzeichen of the Cyber & Information Space Command (CIR) with golden border on anthracite background. Anthracite is the branch color of the CIR.